Past the old market in Siem Reap, along the curve of the river heading out of town is House 472 on Road To Lake. 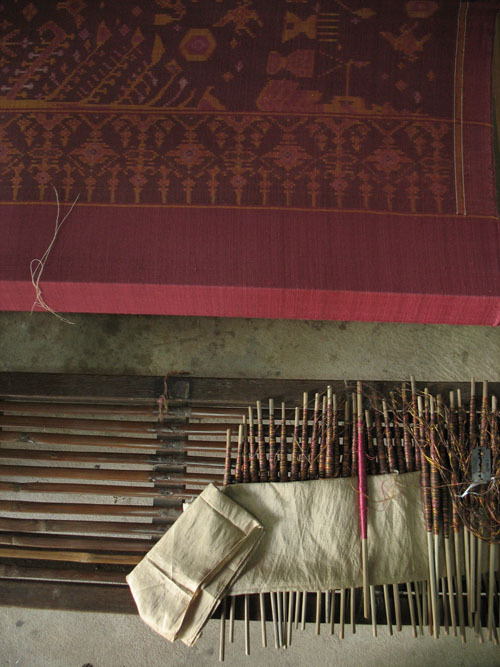 That's the official address of a world-renowned textile workshop and shop called The Institute for Khmer Traditional Textiles, or IKTT. 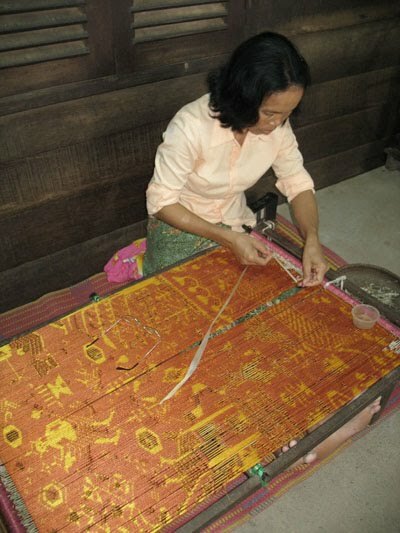 Begun by Kikuo Morimoto in 1996, IKTT is his vision for recreating the glorious Khmer silk textiles which were one of Cambodia's high art forms in the past. 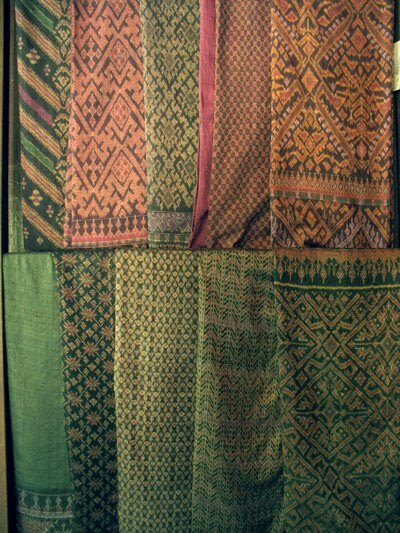 The name is a clever play on the term "ikat" for the tie-before-dyeing patterning technique used to create these works, which in Cambodian is known as "hol". 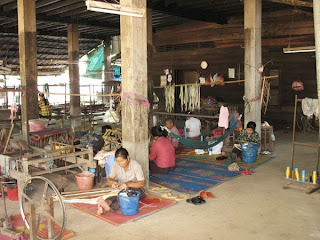 It was not an easy task to find workers knowledgeable in these techniques, since the dark days of the Khmer Rouge had all but eliminated most of them. 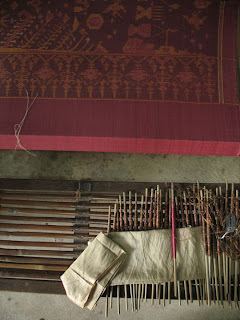 Now, it is most gratifying to visit the unassuming House 472 and find behind the bamboo shades the ground level filled with the competent ladies who are recreating the fine old patterns in new, naturally-colored silk. The large space is filled with looms, spinning wheels and reels, tying stands, as well as babies sleeping in swinging hammocks at their mothers' sides. Above, the shop and offices occupy the open, high-ceilinged space, and here one can admire and acquire the exquisite finished products being made below. Greetings from Kampu-CHA, as the Thais say it. 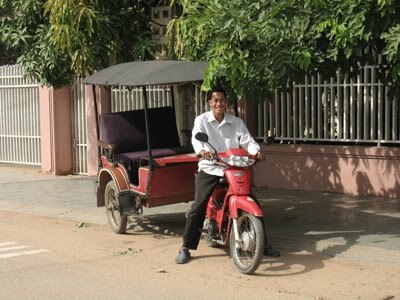 Better known as Cambodia. I've not been here for quite a while and had been wanting to return and see how it's changed. Siem Reap still had a recognizable street layout, but vast stretches that had been undeveloped are now full of concrete mega-hotels sporting names evocative of a long gone, culturally rich past- most with the word "Angkor" included of course. Large shophouse developments were filling in the gaps between the hotels and parking lots sized for tour buses covered vast swathes of land. The roads had improved, with most being paved, tho the ubiquitous red dust was still present, giving it all a 'wild west' feel that was only reinforced by the anarchic traffic and lack of stop signs and traffic lights. Oh, and when it comes to turn signals... "we don't need no stinking turn signals!" One really has the sense that things are wide open, possibilities endless, laws lacking or unenforced. More than once I heard this expressed by resident expats who had come to start businesses. 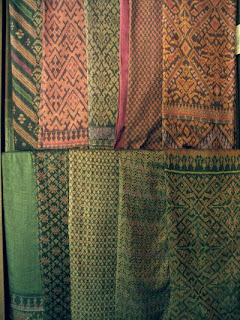 The one thing that had not changed tho was the general good nature of the Cambodian people. 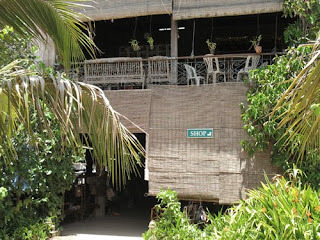 One could not help but feel their friendliness and ease with strangers. Granted, many with whom I came into contact were employed in the tourism industry, be it as drivers, guides, or shop workers, but the smiles and the desire to help or serve seemed genuine. Below is my favorite driver, Mr. Ral. 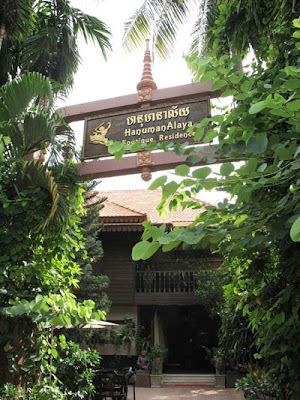 I stayed at the small hotel Hanuman Alaya, which is owned by friend Tan Sotho, and thoroughly enjoyed the gracious Khmer hospitality and beautiful surroundings. The scale is small and it's full of her collection of antiques. 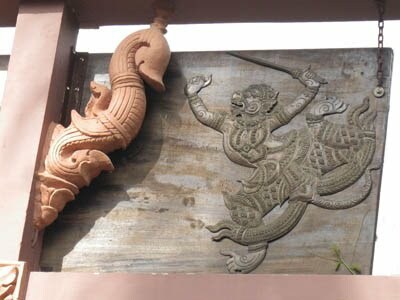 Just one small example of the attention to detail is the back of their sign, which has a beautifully carved image of Hanuman, the monkey king from the Ramayana (below).